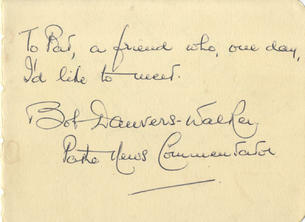 This is a Hand Signed Autograph Album Page 5" x 4" by the late British Radio and Newsreel Announcer whose Voice was well known as the Commentator for Pathe News and has been immitated by many Actors and Comedians. The autograph of Janet Brown is on the reverse. Cyril Frederick 'Bob' Danvers-Walker (11 October 1906 - 17 May 1990) was an English radio and newsreel announcer best known for his broadcasts on Pathe News cinema newsreels during World War II. Born in Cheam, Surrey, Danvers-Walker spent much of his childhood in Tasmania and began his radio career in Melbourne, Australia, in 1925, moving on briefly to ABC in Sydney in 1932 before returning to the UK that same year. From 1932 to 1939 he worked as a presenter for the International Broadcasting Company (IBC) network of commercial radio stations broadcasting in English to Britain from the continent, becoming Chief Announcer at Radio Normandy. He also helped the IBC to set up radio stations at Toulouse, Paris, Lyon, Madrid, Barcelona and Valencia, but Radio Normandy was always the company's flagship station, and Danvers-Walker was heard regularly over its airwaves until the station was closed down at the start of World War II in 1939. Danvers-Walker wanted to join the BBC as soon as the war started, but was prevented by a BBC rule against employing anyone who had worked on commercial radio. This rule was quietly dropped in 1943, and from then on he was deployed on a variety of morale-boosting wartime BBC radio shows, including Round and About and London Calling Europe. His rich, distinctive voice (though not his name) also became familiar to cinemagoers as the anonymous offscreen commentator for the twice-weekly British Pathe newsreel, a job he held continuously from 1940 to 1970. The upbeat, patriotic, "stiff upper lip" style he adopted in this role soon became a kind of standard for the medium, and is still parodied to this day whenever television or film wants to suggest 1940s and 1950s news coverage. Kenneth Branagh has stated that he was consciously imitating Danvers-Walker's "perky tone" in a cod "newsreel" segment in his 2000 film Love's Labour's Lost. Bob Danvers-Walker also worked freelance for many radio and television outlets. He was the announcer on the "rebel" version of the comedy programme Much Binding in the Marsh on Radio Luxembourg when the show was in temporary exile from the BBC (1950-51), and for the science-fiction series Dan Dare, Pilot of the Future on the same station (1951-55). He took part in the "stunt" programme "People are Funny" on Luxembourg, recorded around the UK and presented by Peter Martyn. As far as can be ascertained, however, he was never on the staff of Radio Luxembourg, even though his picture appears on several Radio Luxembourg fan websites. At about this time he registered the personal car number plate RAD 10 which became available in Gloucestershire. The arrival of ITV (commercial television) in 1955 brought many new opportunities, including as the announcer on Michael Miles's popular networked game show Take Your Pick (1955-68) and its successor programme, Wheel of Fortune (1969-71) -- not to be confused with the later (1988-2001) game show of the same name. At BBC radio he was one of the regular presenters of Housewives' Choice throughout the 1950s, and contributed to many other programmes, including in the 1960s Holiday Hour and Countryside. For BBC Television he featured regularly in Saturday Night Out. He also appeared in a number of feature films, often as himself. Danvers-Walker's entry in the Oxford Dictionary of National Biography states that he began to use the full name "Danvers-Walker" only in the 1950s. On a rare surviving audio clip from Radio Normandy, his colleague Roy Plomley is heard referring to him as "Bob Walker", but he was described as "C. Danvers-Walker" in the station's programme schedules printed in Radio Pictorial on (for example) 3 May 1935. Conversely, a 1962 Pathe News Issue Sheet lists him as "R.Walker". It is claimed on several websites that Danvers-Walker (or, in some other versions of the story, Roy Plomley - or possibly both) narrowly escaped being captured by the Gestapo at the radio station in Fecamp on the Normandy coast. This seems highly unlikely: all the available evidence suggests that IBC operations in France had closed down entirely by January 1940, whereas German forces did not invade the country until May of that year, arriving in Fecamp on 11 June.